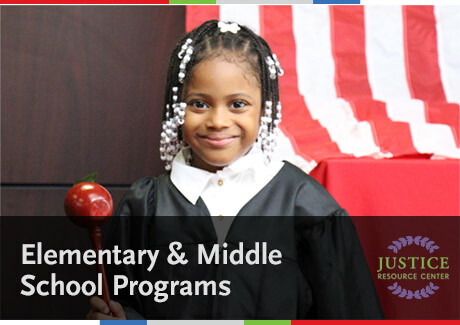 The Justice Resource Center (JRC) is a public/private partnership established in 1991, whose mandate is to develop, implement, replicate and evaluate law-related education projects which impact positively on the school age population in the United States. Founded in NYC, the JRC has moved to international replication. Our programs serve a diverse school-age population comprised of disparate ethnic, racial, and socioeconomic groups, and enable students to learn about the functions of government, understand their roles and responsibilities as citizens, and develop a heightened respect for the law. National MENTOR is designed to pair law firms, solo practitioners, or corporate legal departments with the public high schools. To date, 46 New York City law firms are paired with 46 public high schools. International pairs include, but are not limited to, Venezuela, Russia, The Hague, Argentina, Poland and Georgia. Activities consist of lawyers visiting classes; shepherding students on court trips; and inviting students to visit their firms. These activities enable students to see firsthand, the inner workings of the courts and law firms. Lawyers serve as role models and expose students to law-related professions. The JRC administers teacher professional development workshops on law-related topics, enabling educators to expand their knowledge of the law enabling them to impart knowledge to students. Curriculum development is achieved through an interdisciplinary and/or integrated model approach to the teaching of the law. Materials are disseminated and replicated nationally and internationally. All materials are aligned with the new Common Core standards. Student Projects include, but are not limited to, Internships, Community Service in law-related agencies, Student Conferences relating to Violence Reduction, Special Law Days, Model City Council Simulations, Mock Trials, Moot Courts, Mock Congressional Hearings, Supreme Court role-plays, Public Policy portfolios, Law Enforcement Academies, Federal court visits, Computer Forensics, law-related essay contests, and an International Moot Court. To promulgate law-related projects, the JRC engages personnel from public and private agencies to assist in the implementation of project objectives. This runs the gamut from individual attorneys to large firms, serving multiple roles, such as guest speakers, coaches and sponsors for student law conferences. The JRC has replicated successful “model” Law & Justice schools and smaller theme-based learning communities throughout the New York City public schools. The JRC has assisted school districts, nationwide, and internationally with replicating these models.